Merced County is located in the San Joaquin Valley of Central California, north of Fresno and southeast of San Jose. The county is named after the Merced River that flows nearby and the county seat is Merced known as the "Gateway to Yosemite". 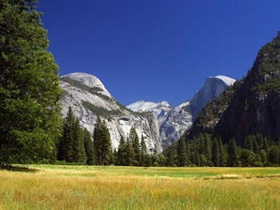 It is less than two hours by car from Yosemite National Park, Monterey Bay, the Pacific Ocean and miles of beaches. 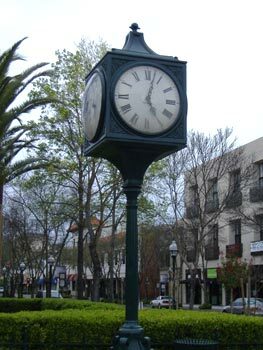 Merced can be described as a "sleepy town" It is the county seat of Merced County and was incorporated in 1889. 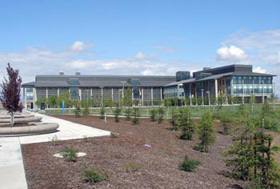 The community is served by Merced Municipal Airport and is home to the tenth University of California campus, the University of California at Merced. Merced Municipal Airport is southwest of downtown Merced. Many people who work in the San Jose/Silicon Valley area come to Los Banos for more affordable housing and safer neighborhoods. It is about a 2 hours from San Francisco, Oakland and Sacramento. The name los banos was named after the nearby creek and spring baths, meaning "the baths". Famous for its melons, almonds, walnuts, apricots, cotton, tomatoes and dairy products, Los Banos still maintains the small town charm and a comfortable, less expensive way of life. Gustine is becoming a bedroom community to the San Francisco bay area and 2hour commute away. Gustine was established in the early 1900s as a station on the Southern Pacific Railroad and named after Augustine Miller "Gussie", the daughter of Henry Miller, the "Cattle King", an early California land baron and Agricultural pioneer. 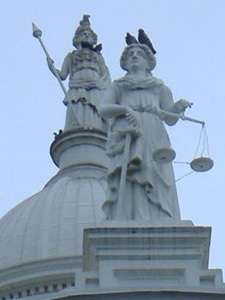 The city was incorporated in 1915. Livingston lies slightly uphill from where the Southern Pacific Railroad crosses the Merced River. Livingston is unusual in that the Merced River has deposited large amounts of sand. The sand is presumably the ground-up remnants of Half Dome, El Capitan, and Yosemite Valley. 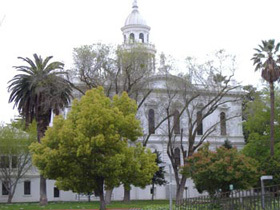 Merced County was formed in 1855 from parts of Mariposa County. The county derives its name from the Merced River, or El Río de Nuestra Señora de la Merced (River of Our Lady of Mercy); named in 1806 by an expedition, headed by Gabriel Moraga, which came upon it at the end of a hot dusty ride. In 1870, when the Central Pacific Railroad constructed its lines down the San Joaquin Valley, the town site was laid out and actual construction began and many buildings of the era have been preserved. 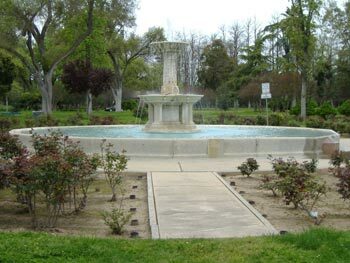 Laura's Fountain: This fountain facing M Street was originally erected in 1888 in front of the Southern Pacific Depot and was moved to Applegate Park in 1935. 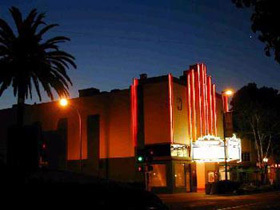 Main Street Theater: Built in 1931 in a Spanish Colonial Revival Style, it was one of the first to be connected with the "Golden State Theater Circuit." Old County Library: Built in 1897 as the first public high school, it was originally a red brick building of the Richardson Romanesque style. Transpo Center: Known as the Southern Pacific Company Passenger Station was built in 1926. Many visitors stayed here on their way to Yosemite. 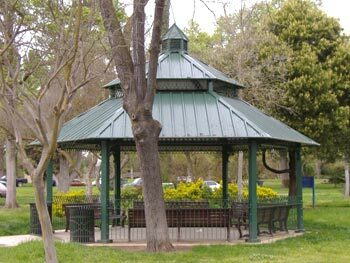 Merced County parks and recreation include Applegate park and zoo, Bear and Black Rascal Creeks and their bike trails, The Mainzer Theater which is known for its historic and architectural value, County Courthouse Museum circa 1889, and the County Library. 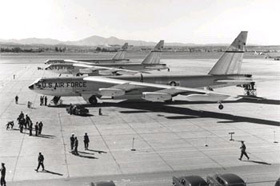 Also within a short distance from the city limits are the Castle Air Museum, Lake Yosemite, and Merced Falls. Yosemite National Park is a national park located in California and covers an area of 761,266 acres and reaches across the western slopes of the Sierra Nevada mountain chain. Over 3.5 million people visit yosemite each year, with most visitors only seeing the seven square miles of Yosemite Valley. Designated a World Heritage Site, Yosemite is internationally recognized for its spectacular granite cliffs, waterfalls, clear streams, Giant Sequoia groves, and biological diversity. The Merced River headwaters are in the southern half of Yosemite National Park. The river flows into the Yosemite Valley. Much of the water is stored behind the dam in Lake McClure and the remainder of the water flows through foothills, and across the San Joaquin Valley to join the San Joaquin River. The Merced River is protected under the National Wild and Scenic Act. Numerous recreational opportunities are available along the Merced River including fishing, kayaking, whitewater rafting, camping, hiking, swimming, and picnic areas. Full service Internet Access Provider. 25 W. Dickenson Ferry Rd. Propane sales and service for residential and commercial customers. Full Service Residential & Commercial Plumbing! Dealing in commercial and residential real estate for Merced County. We will customize, upgrade, or design an innovative computer system for you. 24hr Service and Repair Specialists! Specializing in Los Banos farm land, acreage, commercial, investment property, and developmental land. Computer Sales and Service. On Site service is available. We offer a full range of architectural services. More Than 25 Years Experience! New and used farm equipment sales. Specializing in Tractors-new & used, parts, and misc. farm equipment. Espresso Drinks, Gourmet Coffees, Beans, and Gifts. We cater weddings and parties. Automobile emergency Roadside assistance 24 hours a day! We offer services for towing, lockouts; tire changes, dead batteries, and no gas. Proud Distributors of the World's Greatest Beer...from Anheuser-Busch, Inc.
Full service brokerage and property management. "Specialized service by specialized agents!" ROAD SERVICE Call anytime for sandblasting, diesel and gas, tire service, welding, or mechanics. We are a Title and Escrow Company. We have four offices locally. Welcome to the Merced County, California website, your community on the Internet. Here you will find valuable information about Ulster County including coupons, restaurants, shopping, hotels, local businesses, parks, recreation, government, history, real estate, public services, dining, arts and entertainment, spas, salons, schools, sports, automotive, banking, shops, healthcare, relocation, travel, tourism, and vacations in Merced County, Atwater, Ballico, Cressey, Delhi, Dos Palos, El Nido, Gustine, Hilmar, Le Grand, Livingston, Los Banos, Merced, Planada, Santa Nella, Santa Rita Park, Snelling, South Dos Palos, Stevinson and Winton. 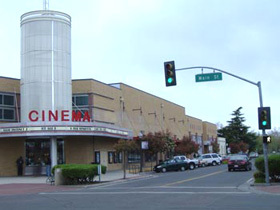 Places of interest in Merced County include The University of California at Merced, Yosemite National Park, Merced Municipal Airport, Monterey Bay, San Joaquin Valley, Los Banos Municipal Airport, Merced College, UC Merced, Applegate Zoo, Bear Creek, Black Rascal Creek, San Joaquin Valley, Merced River, Laura's Fountain, Main Street Theater, Old County Library, Transpo Center, Hotel Tioga, Merced Municipal Airport, University of California at Merced. Southern Pacific Railroad, The Mainzer Theater, County Courthouse Museum, Castle Air Museum, Castle Airport, Lake Yosemite and Merced Falls.